You know, just once I would have liked to see Gomer Pyle hit by lightning. When young Billy Batson says aloud his magic word, Shazam, he is granted powers that make him the world's mightiest mortal! Since Captain Marvel is a rather innocent and naive hero, I thought that making him from Batman/Superman Animated figures would be appropriate. The body is a Capture Net Superman, and the head is from the most recent Bruce Wayne figure. I carved a happier expression on the dour Mr. Wayne's face, and created the cape from Model Magic and a twist tie. 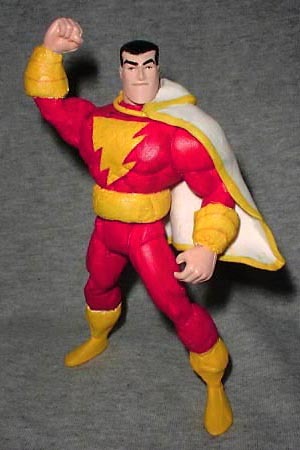 Captain Marvel is 5" tall, and has four points of articulation. I boiled and popped to swap the figures' heads, but Bruce Wayne's neck peg was longer than Superman's, so I ended up gluing the head in place anyway. Oh well. Shazam! Do you know all the powers granted by "SHAZAM?" Tell us on our message board, the Loafing Lounge.